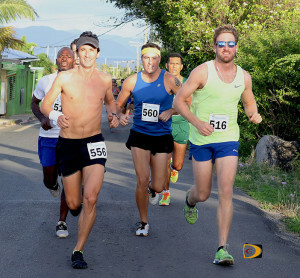 Guy Williamson, left, Julius Farley, behind Williamson, Jeremey Zuber, Reuben Stoby to Zuber’s left and Vincent Fournier, forms the lead pack on Millionaire Road, in the early stages of Saturday’s 6th Virgin Gorda Half Marathon. About 9½ miles into Saturday’s 6th Virgin Gorda Half Marathon as they descended into the Coppermine turnaround, the faces of Julius Farley and Reuben Stoby at that point in the race, told two different stories. Farley was relaxed and gave a thumbs up while Stoby who would later revel he was suffering, grimaced. By time they reached the finish line of the 13.1 mile race, the narrow lead Farley held in Coppermine had been extended, after he took away Stoby’s thoughts of mounting a challenge, relegating his rival to second place for the third successive year, by beating him for the first time in 2017. Farley covered the Virgin Islands most challenging Half Marathon course over some of Virgin Gorda’s steepest climbs and scenic vistas and tour stops of Coppermine and the Baths, in 1 hour, 35 minutes and 38 seconds. Stoby finished in 1:35.54. Defending champ Vincent Fournier of Virgin Gorda, was third in 1:39.38. Farley said the victory was special because Stoby has a winning streak against him since last year. “To beat him is special to me,” he said. Stoby called it the Virgin Gorda Half Marathon jinx. Former Virgin Gorda resident Kathleen Brownsdon who now lives on St. Croix, was ninth overall in 1:55.32 and said she was lucky to win. Race director McNutt announced it was her last time organizing the event and thanked participants and the community. Over its course, the event she said, raised over $18,000 for community groups and charities.